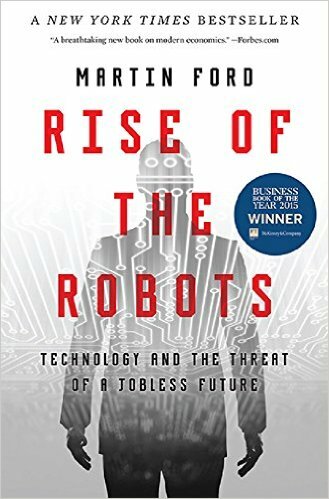 While preparing a speech about the impact of technology on higher education, I found a reference from the “Transforming Higher Education” chapter in Martin Ford’s new book, Rise of the Robots. Curious about the thematic link with higher education, I bought a copy. As expected, I found parallels with other books that I had reviewed, including Nicholas Carr’s The Big Switch and Brynholfsson’s and McAfee’s The Second Machine Age. Both of those books encourage education as an important means to career success as technology continues to replace jobs through automation. Ford cites both books, but provides a colder, harder dose of reality about technology’s impact on the job market than these authors do. Rise of the Robots begins by discussing robots and automation. Ford writes that similar to PC software growth, robots will be developed to handle almost any commercial, industrial, and consumer task imaginable. For example, ROS, or Robot Operating System, developed by Stanford’s Artificial Intelligence Laboratory, is open-source and free, meaning that developers can enhance it, providing a market-standard tool that continuously improves for future robot developers. Advancing technology in robots used in manufacturing in China resulted in a loss of 16 million manufacturing jobs there between 1995 and 2002. Unlike people, robots can work continuously and as technology costs decrease, they are more likely to replace humans even when wages are low. The author demonstrates the impact of Moore’s Law regarding the acceleration of technology through the doubling of computer processing power every year and a half to two years over the past 40 years. He also points out that the Singularity (the theoretical point when computers become smarter than humans as described by Ray Kurzweil and others) is likely, and that only the exact timing is uncertain. Smarter computers will find ways to continue to increase automation and replace jobs. Advances in artificial intelligence will improve robotics as well as automated decision making. While humans may try to slow down the pace, it is likely that governments or large corporations will fund the development of smarter computers for the advantages that may accrue in warfare or business. Ford discusses the importance of discussions about the ethics of using machines to determine outcomes that were formerly controlled by humans. Over the years, there have been many narratives and reports noting the impact of increasing automation on jobs. Ford writes that it’s different this time because of seven deadly trends, including: stagnant wages; a bear market for labor and a bull market for corporations; declining labor force participation; diminishing job creation and soaring long-term unemployment; soaring inequality; declining incomes and underemployment for recent college graduates; and, lastly, polarization and part-time jobs. When these trends are evaluated collectively, the case for technology’s role in disrupting our economy is most convincing. Ford also cites three other trends as influential: globalization, financial sector growth, and politics. He cites a 2013 study by Frey and Osborne, who conclude that nearly half of U.S. jobs are vulnerable to automation over the next 20 years. He further states that the ability of IT to substitute for workers and create winner-take-all scenarios will have a dramatic impact on our economy and our society. Two industries that have been the least disrupted by technology, according to Ford, are higher education and healthcare. 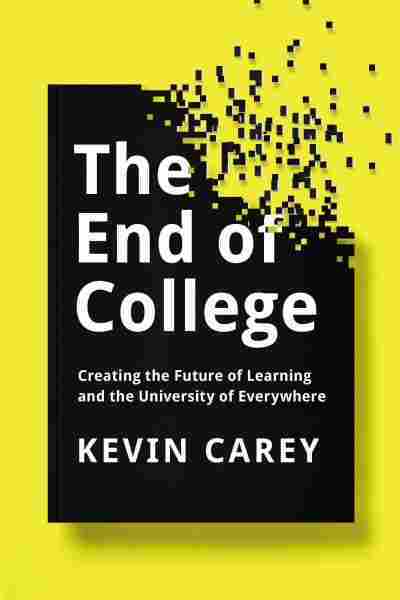 Online education, machine grading, MOOCs, competency-based learning, and adaptive learning are the innovations he sees as potentially disruptive to higher education. Artificial intelligence, hospital and pharmacy robotics, eldercare robots, and predictive analytics, in turn, are likely future disruptors of healthcare economics. Ford notes that economists disagree on whether or not a shortfall in demand is holding back economic growth and if income inequality is the major contributor to the problem. He claims that many jobs will continue to be eliminated due to technology and that more people will be fully unemployed instead of simply underemployed. With no pay, more people will be unable to spend and deflation is a major risk. With the population aging and rising inequality, Ford predicts that consumer spending will decrease, triggering more job losses. He suggests that the skills ladder is not really a ladder, but a pyramid with less room at the top, increasing the probability that fewer jobs will be open for people to migrate to as technology eliminates their jobs. In his concluding chapter, Ford discusses a study that published labor data for the 15-year period from 1998 to 2013 (and arguably, one of the periods in which technological change increased most rapidly). During this period, the value of American goods and services increased by 42 percent after adjusting for inflation. The number of labor hours required to accomplish that in 2013 was 194 billion, the same as in 1998. During the same period, the U.S. population grew by 40 million. In order for the labor hours to be the same during a period when the population grew, more people had to drop out of the workforce and had to shift from full-time to part-time employees. Ford’s point is that technology had a major impact on this increase in productivity and lowering of workers’ wages. A perfect storm is on the horizon where the employment situation could worsen. Creating a future that improves the prosperity for all may be our biggest challenge. Whether you’re a parent, grandparent, student, teacher, employer, employee, policymaker, regulator, or retiree, Martin Ford’s book will make you think about what options we have that will enhance prosperity for our people and our country. The road ahead is not without its potholes or washouts. We need enlightenment and teamwork, not polarization. 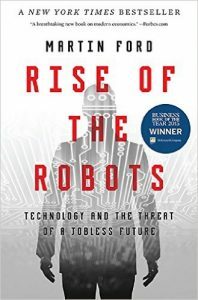 Rise of the Robots is a book that can and should stimulate the national discourse.